Join the discussion on our forums! Come discuss Kangor's Endless Army over in our dedicated Kangor's Endless Army discussion topic. Resurrect 3 friendly Mechs. They keep any Magnetic upgrades. This card is pretty decent, especially in a paladin deck built around magnet buffs and Mechano-Egg. It is kind of reliant on RNG, as I've seen a few paladin revive 3 small mechs. This is the only card im missing for mech pala, should i craft it, is it good? If you bring them back without any buffs cause you didn't get the chance to play any buffs then you can buff them when you bring them back? Well, this could work very well with Damaged Stegotron for bringing them back. Otherwise, not too sure. Mana-cheating is always very powerful. This cards either a 1 or a 5.
if mech paladin is a thing this is a 5, if it's not this is a 1. So there you are, playing a slow, control mech paladin, and it is finally time for Kangor's Endless Army, and then... Counterspell ! Well, this sure is pretty good but imagine all the combinations you can play. Anyfin Can Happen was used with only one combination of minions (+/- Murk Eye) for the deck to work. This card can be used depending on the matchup. Meaning if you play against a aggro deck, then you will try to magnetize your minions into taunt or rush ones and so on. I hope they will add some mech cards with Magnetize that would have discoverable keywords. 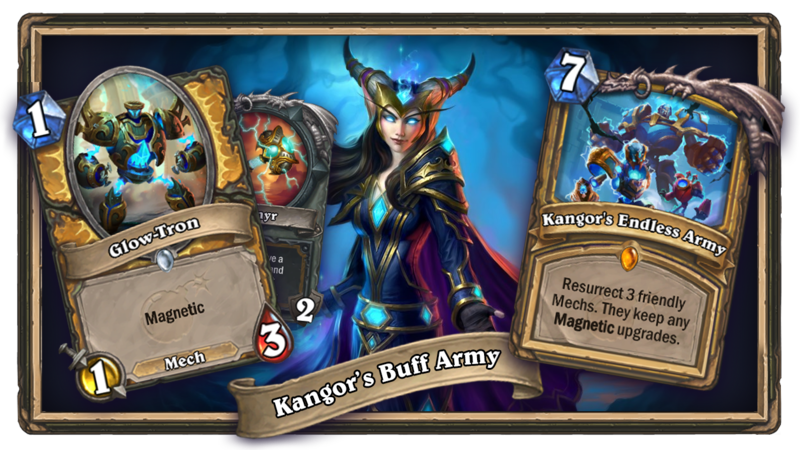 Also i think Enhance-o Mechano should be reworked so that the buff's should be considered Magnetic for the mech tribe. Don't know if it would be too OP but as of now the card doesn't see play but with this change it could be part of a top tier mech deck in the next expansion. And even the Spare Part mechanic should be considered Magnetic. The big problem with that is there were Murlocs with charge that you could abuse. So far they haven't released a mech with charge, so this just becomes "put a bundle of stats on the board." which isn't a wincon. If it was, Control Paladin would already be a viable deck with Lynessa. And I mean, sure, they've only released half of the cards of something - but if I don't see a charge mech, then this isn't going to be a wincon. Sure, Hadronox and Witching Hour exist - but Hadro by itself was never a competitive deck, it was only after they released Witching Hour and you could rez Hadronox and kill it, thus rezzing full boards multiple times, before it became a good deck. This is a legendary spell, so you can only use it once in a match - which doesn't bode well. This is a 10x better win condition than lynessa. If you put three big guys on board with this, one silence won't kill all of them. Can't say the same for lynessa. This will probably be used turn 8 or 9 after your opponent has already exhausted his removal on your threats. Of course this isn't an OTK setup or anything. I was just thinking about the flexibility of the card. Anyway, i tried many combinations of mech's with other magnetic ones but the results aren't very good. Best you cna get is a Taunt - Divine Shield - Lifesteal - 1 Damage to all other characters - Mech that has a 6-7 body. 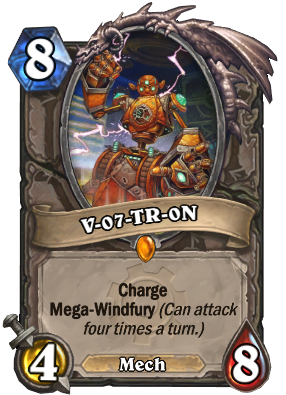 For this card to be part of a viable combo it should've said "Resurrect 3 friendly mechs that have been magnetized. They keep all magnetic effects." 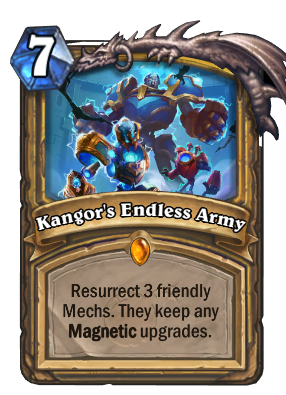 In a normal match, you probably won't be able to magnetize each of your mechs ( in a potential mech Paladin deck) and will have a chance to resurrect 3 simple mechs at 7 mana. Also, the scenario where you keep the mechs for the time you can combo them with magnetize will most likely get you killed by all the other aggro decks out there (assuming you play the mech deck in Wild, where all the other mechs are now). Oh, looks like they just needed some new batteries. This looks clunky to set up. So you may set up the board for lethal, summon great wall of mechs or just make some trollish effects? Love that!